I didn’t think YOU would judge a book by it’s cover Iona! You are right, Ron! Thanks! 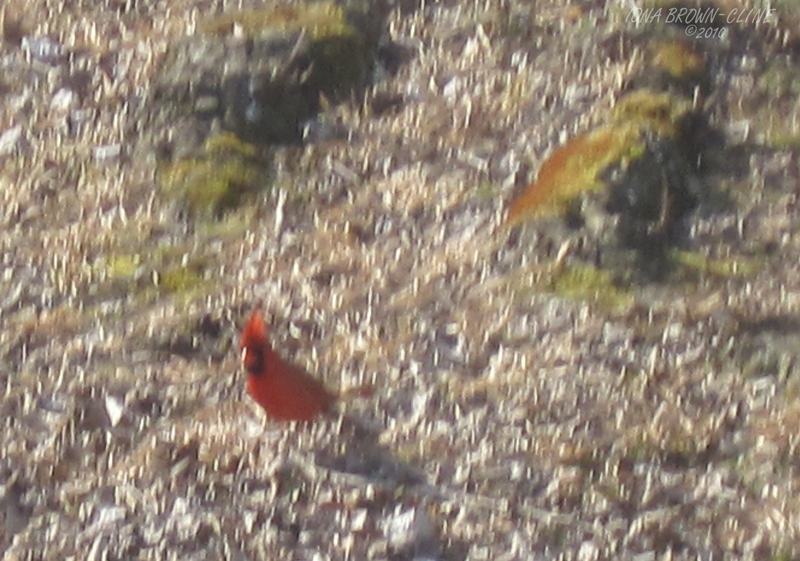 Now that is a real treat…we rarely see cardinals (and definitely not this early in the season)…I would get what I could get too…fast thinking! We have Cardinals and Blue Birds here year ’round, Tammy. They are so quick, it is hard to get a decent shot. Ordinarily, I would scrap these shots. But since the bright red is such a relief from the dreary winter, I gave it a try. Appreciate your visit, as always. 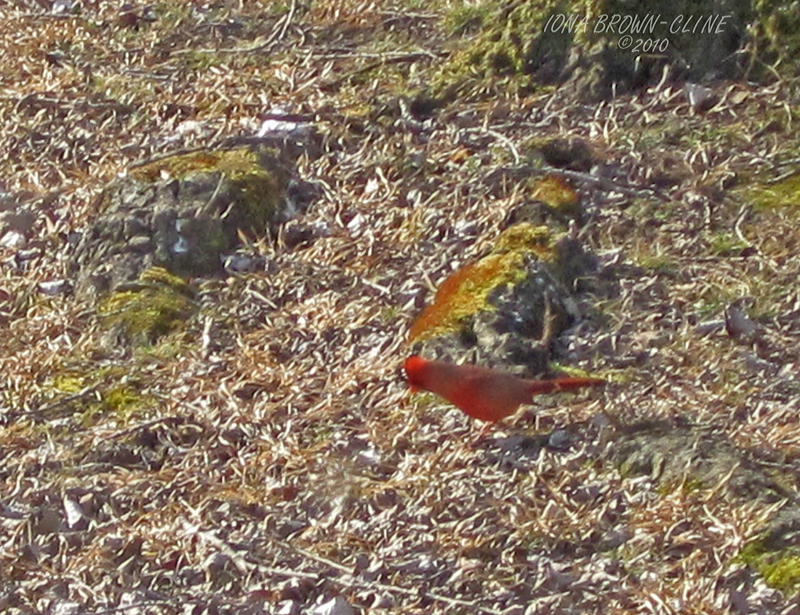 Birds are so hard to photograph – they always move when I try too. I think you did good! Don’t know how good I did Mari! But at least got some of the color injected into a hope for Spring for what has otherwise been a dreary winter. Thanks for dropping by and the comment. I know what you mean about birds being difficult to photograph. 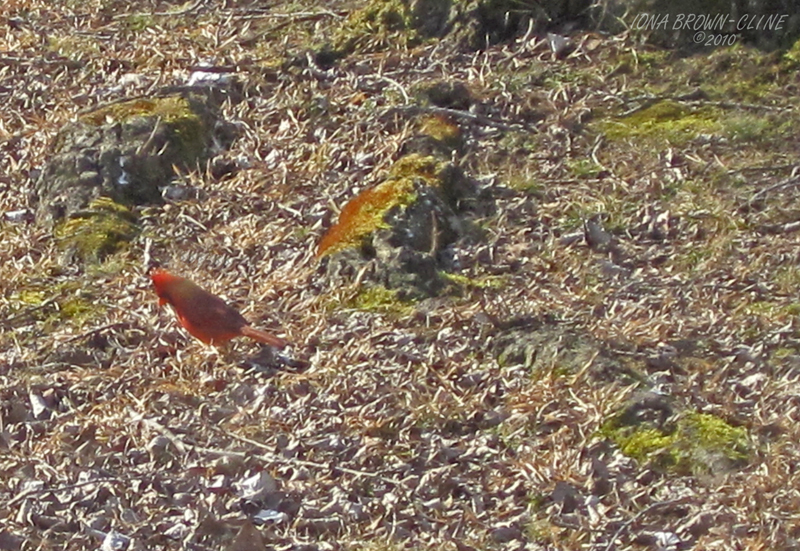 Cardinals are a rare treat here: we see maybe two in a whole summer. Terry! Your treats are Eagles, and Mountain Goats – so don’t quibble! lol It is nice to have a flash of color at this time of the year when everyone is tired of the winter blahs! Your comments and visits are always welcome. I remember when you first showed me some bird photos several years ago that you had taken out the window. Those were amazing too! There aren’t many other birds here in our yard. We sometimes get little yellow and black birds and some little brown birds (you like my naming system? ), and some blue jays. Sis! The problem of taking bird photos once the trees are full is really awful. I can see a bright bird fly into a tree, and utterly disappear! The only way to get a shot would to be to sit hours and hours with camera in hand and on in order to get a fleeting fight shot! Humming birds are rare here. Don’t know why. I am really astonished with your yard full of flowers you don’t have more birds. We have the Blue Jays, Cardinals, Blue Birds and various others. The Goldfinch visit on their flights through to other places. They are cheerful tiny little things. A whole flock can land in the yard, and if it weren’t for movement, one would never know there were birds there!!! We also have a couple of doves, which I’ve seen from afar. Several robins, even a starling or two. And the huge flocks of Grackles, which I wish would go some place else!! About 3 months ago, I was driving home from an errand. A field along the road was black, which I thought was unusual. When I drove near, the whole field in one motion, rose and flew over the vehicle. Huge flock of Grackles. That week, I traveled the same road several times. The Grackles seemed to migrate from field to field until they had covered the entire area, stripping it of whatever they could find. In my opinion, they deprive the other birds due to their numbers. I mostly name birds like Esther does. Aren’t cardinals amazing? Lucky you to have them visit. Our Cardinals are here year ’round, Ellen. During the winter, it is a joy to see one fly between the trees. Just like the Blue Birds. Thanks for your comments and visit. Thanks for your comments on these poor photos, Eleanor. Our little red friend is so cheerful and welcome at this time of the year. I love them. Montucky is a great photographer, in my opinion. Of course, the turkey is another one of God’s creations and in its own right, beautiful as well. I grew up with them as Mother raised them. Trying to capture anything wild is a challenge. Thanks again. What great shots. I would have taken what I could get also. Very creative use of this theme.